So many empty seats (via Chris Ptacek). 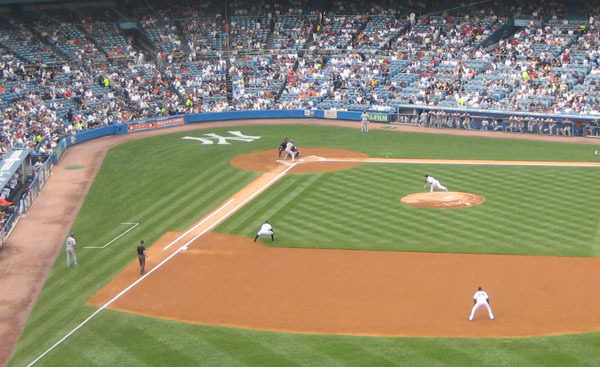 The Yankees opened up a new stadium in 2009. 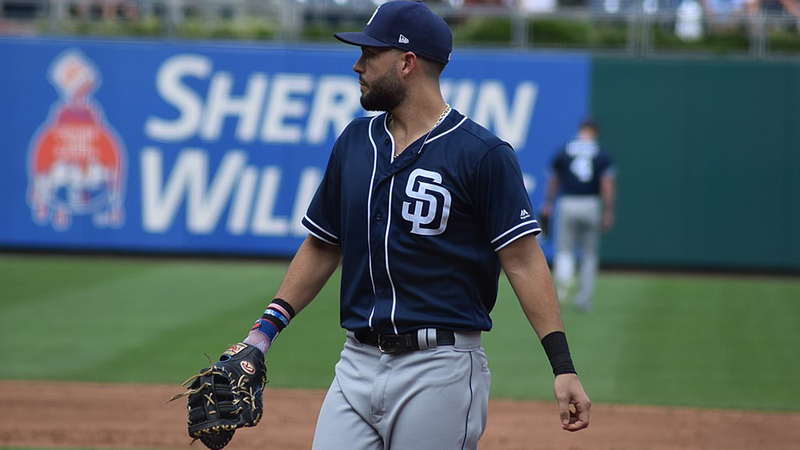 According to the team, it was supposed to create 1,000 new jobs, and Tyler Hoof was going to get one of them–specifically, one of the waiter jobs in the expensive Legends Suite behind home plate. He wanted an extra job for a little extra cash. Not that working at Bond 45 in midtown was no good, but a little walking-around money would be good in the most expensive town in America. The stadium cost $1.5 billion to build, making it the most expensive sport venue built in America at the time. And it would be home to the most expensive baseball team of all time. In 2009, the Yankees were projected to spend $65 million more on player salaries than the second-most expensive team. And because the Yankees had been selling out forever, nobody blinked at the 52,000-seat capacity or the $2,625-per-game premium seats in the first couple of rows behind home plate. On the day of the mass hiring, the line wrapped around the stadium, literally; it was a joke. I walked pass the entire line to the front and told the security guard I had an appointment with one of the managers. I was wearing my Burberry. He ushered me inside the gate to the front of the line where I filled out a basic questionnaire. After that I was next to be interviewed and was hired on the spot. I never made any money working there; the Legends club patrons are cheap when it comes to tipping their servers. Turns out, the timing wasn’t great on the new stadium. Remember 2009? Since 1947, only two quarters have been anywhere nearly as bad as the first quarter of 2009 was for America. The GDP shrank by almost double digits, and belts were tightening everywhere. That’s probably why Hoof had to pull some shenanigans to cut to the front of a crazy line of hopefuls. That’s also why corporations weren’t falling over themselves to shell out the high prices for seats behind the plate. Johnny Damon understood. No wonder the ones that did show up didn’t tip Hoof well. On a scorching hot afternoon in late May, after the second inning and the clubhouse was quiet, my boss saw I wasn’t doing anything, so she told me and S_____ to give out some ice cream sandwiches to our guests. 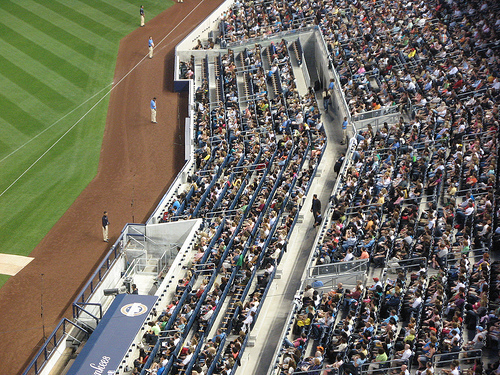 Most damning of the new stadium, perhaps, were the pictures of empty seats everywhere, especially behind home plate. Take a look at the header image above—just a night game, just like any other—and see all the missing bodies. Now take a look below at a picture from 2008, and the old stadium, thanks to Josh Greenberg. MLB.tv doesn’t go back that far, or perhaps it would be more stark. Still, you can see the area behind home plate is well-stocked. The House that Greed Built became an easy nickname for the stadium. Some blamed the Legends Suites themselves for the empty seats behind home plate. With your high-priced ticket came free food and water from the restaurant under the stands behind home plate. You didn’t have to sit in the elements if you didn’t want to, a fact that wasn’t lost on those watching on television and wondering where everyone behind home plate was. Hoof usually was serving those missing patrons in the Legends Suite Club under the stadium. In fact, with your high-priced ticket came a separate entrance through that restaurant. The very richest never had to rub elbows with the plebeians. On the other hand, after an underwhelming start to the year, things were looking better for the team. Headed into the game on May 20, the Yankees were 22-17, in third place and three and half games back of a surprising Blue Jays squad. But the Bombers were on a seven-game winning streak. Phil Hughes headed to the mound against Jeremy Guthrie and the Orioles. By the second inning, the Yankees were already up 3-0 on the Orioles thanks to a Melky Cabrera home run. An afternoon game during the week, headed towards being a laugher … it’s actually a surprise more people weren’t in the restaurant. But during a hot game, for customers that paid well for their seats, free ice cream was a pretty good idea. We loaded up the biggest coolers we could find and started tossing bars behind home plate and made our way towards first base. I belted out, “Ice cream! Free, ice cold ice cream”! Anybody that heard me wanted it. The people in the cheap seats were screaming for it, but we weren’t allowed to give it to them. I told them they didn’t pay enough. There’s a moat. There’s a moat between the Legends Suite seats and the rest of the stadium. Take a look at it in Gary Dunaier’s excellent picture below. It’s a moat, and it’s called The Moat by most involved. The Moat (photo used with permission). Some stadiums have similar features, but this is one of the starkest in baseball. And all the medieval connotations that come with it seem to fit. It’s large and looks like it would funnel water well, but more importantly, it separates the very richest from the rest of the crowd. And it prevents young fans from being able to come up to the railing and ask for autographs before the game starts, a ritual in most parks. Usually, the free stuff that ostensibly separates the two brands of fans down in the lower bowl is kept discrete. Your free water bottle is handed to you with your wristband—enjoy the all-inclusive resort—and the restaurant where Hoof usually worked is in the bowels of the park. On May 20, though, the free ice cream came out into the seats and was agonizingly alluring to those hot fans in the slightly-less-expensive seats around the Legends seats. There’s no chart needed to prove that people like free crap. So just look inwardly and ask yourself in an honest moment if you could really restrain yourself from yelling for free ice cream on a hot weekday during a game that might be headed towards laugher-ism. Considering those desserts cost close to $10 a pop in the concession stands, it’s not like people were going nuts over a cheap figurine that was stamped out of plastic for 91 cents a pop in China. This was real, cold food on a hot day. And the rich seats were throwing some back to the … almost-as-rich seats. I mean, the average price for a lower-bowl ticket close to the Legends Suites was still close to $500 a pop. But credit a few nice fans for including those around them in the fun they were having. We were throwing sandos every few seconds, melted or not. The guests loved it; I was having fun myself. First security came up to us and told us to “shut it down.” I told him my boss told us to do this, and we’re not going to stop until our boss told us so. At this point, everyone along the first-base line was standing up watching us and not watching the game. We kept wailing bars to anyone with their hands in the air. I bet at one point there were over 30 ice cream bars flying around. Marie Anotinette may never have said that infamous line—”Let them eat cake!”—but she’s been saddled with that unfortunate phrasing for some time now. A reference to the French Revolution fits perfectly, though. My boss appeared minutes later. I remember her face was beet red, she was so pissed. We were escorted back to the clubhouse for a lecturing and cut from the rest of our shift that afternoon. She never asked us to pass out anything ever again. Turns out, Hoof lost his job a week or so later, perhaps because of this incident, perhaps not. If it was because of this, it’s good that he had a better job from the get-go, or this would be a tale of tragedy: The Day That a Little Fun With Ice Cream Cost a Real-Life Person His Real-Life Job. Instead, since Hoof is fine now and was fine with losing the job, we can laugh with a wink. Sometimes, the people rise up in opposition to the systems put in place to keep us down. Sometimes, the rich agree with the poor and hold out a helping hand full of ice cream, even in front of the frowning face of authority. Sometimes, the moats put up between us collapse under the weight of flying dairy. If just for an inning on a warm day in May. 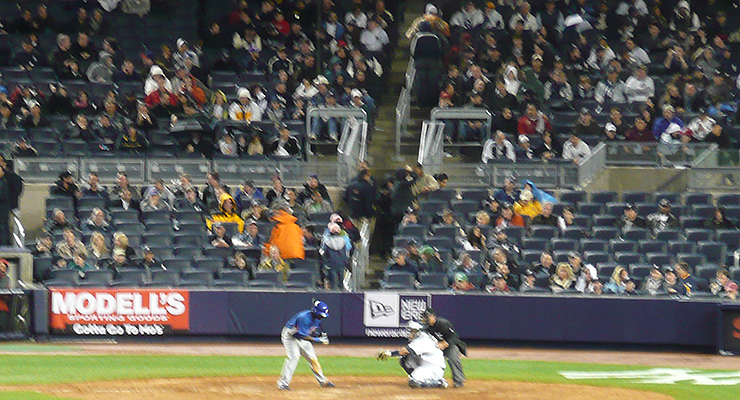 The view from the CF camera which includes the pitcher, home plate, and the crowd is the de facto face of any MLB park. It baffles me that the Yankees (and other teams) didn’t seem to factor that in when designing their fancy new stadium. There’s a sort of moat like that at PNC Park, too. You’re not even allowed to use it to walk from one side of your cheaper section to the other. Berlin Wall might be a better analogy. Great read. Death to the proletariat!! An “ordinary” 427-cid Sting Ray, able to run the quarter-mile in 13.6 seconds at 105 mph, surely was enough to satisfy any reasonable person. At least until the next Corvette generation arrived.